We will coordinate the drop off and completion dates to work with your schedule. We will set appointments that are most convenient for you, or you may simply leave your vehicle with us for an appraisal during business hours. We can pick up and/or deliver your car to and from your home or workplace (within a 10 mile radius with advance notice on collision repairs). 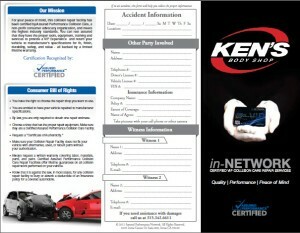 Collision repairs are warranted at All Assured Performance repair shops nationwide. We offer preferred customer priority service, and will make your rental car reservations for you at the best discount available. Signature Detail (exterior wash & dry, interior vacuum and wipe-down, and brush-touch small chips, a $59.95 value) with any collision repair. 5% discount on any repair not covered by insurance. A multi point inspection and report covering both body and mechanical system. 30% off a New York State Inspection. 20% off any engine oil and filter change.